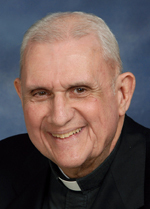 Father Charles D. Smith, 80, a parish priest and educator, died Aug. 6. Born in Philadelphia the only child of the late Charles D. Smith and the late Lillian M. (Jones) Smith, he attended St. Helena School and Northeast Catholic High School before entering St. Charles Borromeo Seminary. He was ordained May 22, 1965 at the Cathedral of SS. Peter and Paul by Archbishop John J. Krol and his first assignment was as a parochial vicar at St. Joseph Parish, Downingtown. He also served at Holy Saviour, Linwood; Our Lady of the Assumption, Strafford and St. John the Evangelist, Morrisville. In 1969 he entered the educational apostolate at Cardinal Dougherty High School and remained there until 1985. He then served as parochial vicar at St. Dominic, Philadelphia; St. Callistus, Philadelphia; and from 1991 until 2008 at St. Martin of Tours. As a senior priest and in retirement he lived at St. Albert the Great, Huntingdon Valley, where he remained until his final illness. Msgr. Joseph McLoone knew Father Smith at three different stages of his life. When he was a kid growing up in Incarnation Parish, Father Smith would have summer assignments there. Later when Msgr. McLoone was at Cardinal Dougherty High, Father Smith was a teacher there. Finally they shared a rectory when both were assigned to St. Martin of Tours. Msgr. McLoone also remembers his quiet generosity and thoughtfulness. “When my father died, without being asked, he took my communion calls and did them himself,” he said. Father Smith was also a homebody and he wasn’t into fancy vacations. He loved parish work and the camaraderie of rectory life, Msgr. Mcloone said. Father Smith had many fond memories of St. Martin and especially St. Helena, which was not only his childhood parish but his residence during his teaching years. “He had a great love for the parish and for Bishop (John) Graham who was the pastor at St. Helena,” Msgr. Duncan said. There will be a viewing for Father Smith at St. Albert the Great Church on Thursday, Aug. 10, at 9 a.m. followed by his 11 a.m. funeral Mass celebrated by Bishop Edward M. Deliman. Concelebrants will include Father Castellani, Msgr. Gregory Fairbanks, Father Peter Welsh and Msgr. McLoone, who will be the homilist. Interment will be at Resurrection Cemetery, Bensalem.